Below are 3 stills from James Blue’s documentary The March, documenting the 1963 March on Washington 50 years ago by 200 000 peaceful protesters, which culminated in Martin Luther King Jr’s historic “I have a dream” speech. The non-violent revolutionary envisioned that the next generation of Americans would be judged by “the content of their character” and not “the color of their skin”. 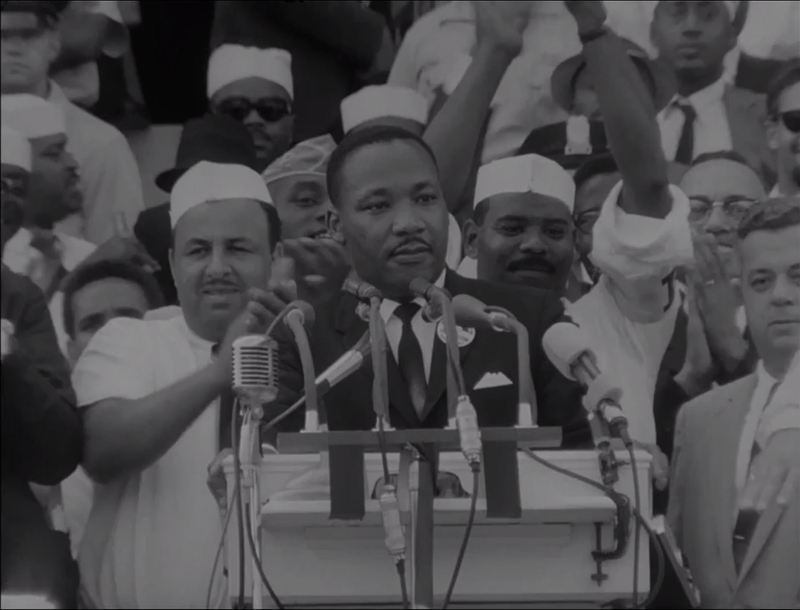 This is a low-quality version of the entire 16-minute “I have a dream” speech, with the option to see sub-titles in English or French. Or The March‘s 6-minute edit of King’s “I have a dream” speech, which begins 23 minutes in. The March by James Blue has just been restored by National Archives. The film was shot in 35mm black and white — given the beautiful low-contrast image, I suspect that they used Kodak’s Double-X stock. Unfortunately, Blue’s film lacks a few tight shots in the middle of the speech — Barry Strongin explains in his comment below that is this is because Blue’s camera malfunctioned. Nevertheless, The March remains a unique document of one of the shining moments in the history of the United States. See also The Bus by Haskell Wexler. Reverend Martin Luther King, Jr was awarded the Nobel Peace Price in 1964 for his non-violent campaigns to end racial segregation and promote equality. He was assassinated in 1968 at the age of 39. He is rightfully honored as one of the great Americans, alongside Washington and Lincoln. Thank you for your post regarding James Blue’s recently restored USIA film, THE MARCH (1964). 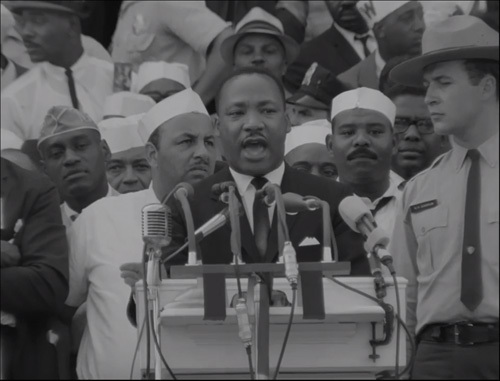 I was a student of Blue’s at the University of Buffalo in the late ’70s, and I recall him explaining that his cameras lost sync-sound during Dr. King’s famous “I Have a Dream” speech, hence the absence of medium shots and close-ups. Unfortunately, the King family and their lawyers claiming copyright ownership of the speech have recently forced the National Archives to redact the soundtrack of the speech from Blue’s award-winning film. 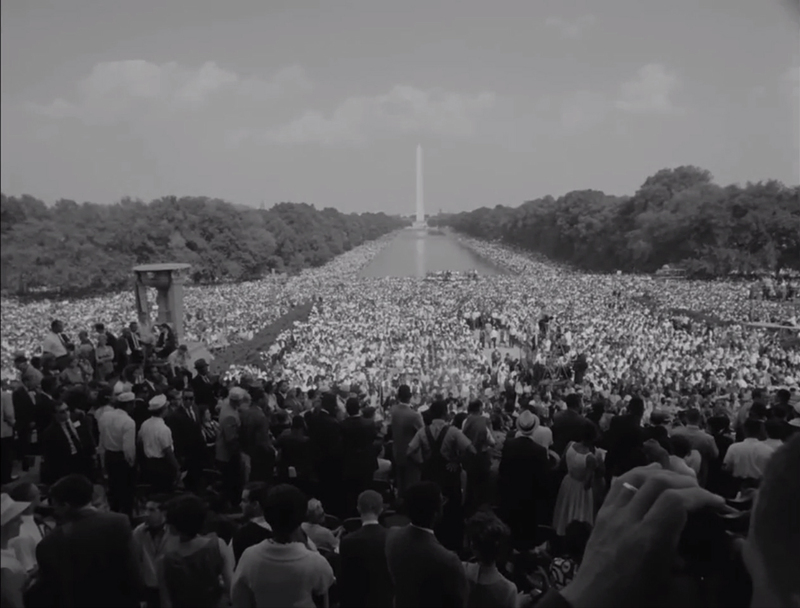 THE MARCH, a poetic documentary of a great historical event, is now bereft of the soundtrack for its most important and transcendent sequence. Please visit: Remembering Documentary Filmmaker James Blue (1930-1980). Thank you Barry for the heads up about the copyright issues, and for the explanation for the missing tight shots of the speech.